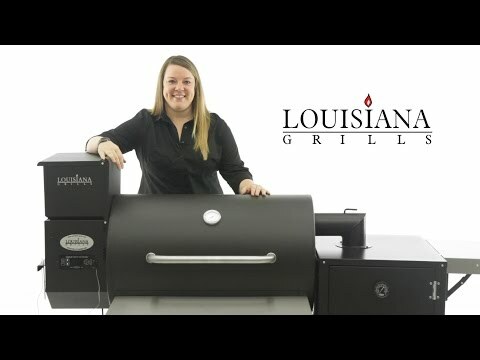 Perfect for large families and gatherings, the Louisiana Grills LG900 series pellet grill delivers world class BBQ. This versatile wood pellet grill offers the capability to bake, roast, braise, smoke, grill, sear, char-grill and BBQ with ease on your backyard patio. The grill is constructed from heavy-duty, powder-coated 14 gauge steel for enduring durability. The LG900 main level cooking grate features 633 square inches of space while the upper rack offers 280 square inches for a comprehensive total of 913 square inches. With the large stainless steel burn grate installed in the burn pot and the flame broiler in the open position, you can reach temperatures up to 600 degrees for fast and fiery grilling. Fan-forced convection cooking ensures even temperatures throughout the grilling area and a proprietary exhaust system allows for even smoking. The auto-start electric igniter and feed system lets you set your temperature, push start, sit back and relax. The natural wood pellets feed into the burn pot where they are automatically ignited and the fan-cooled hopper and feed system keeps your grill at the temperature of your choosing. The hopper features a capacity of 14 pounds. The Digital Control Center lets you set your desired temperature and automatically maintains it during the grilling process. With the included food probe, you can set you desired food temperature and the grill will automatically go into smoke mode when that temperature is reached, preventing over cooking. The lid thermometer enables you to monitor the temperature inside the grill and the grease bucket catches run off grease from the flavor guard. The vented grill handle stays cool even when the grill is cooking at high temperatures The LG900 cart has a solid bottom shelf for storage and also features heavy-duty casters for easy mobility. Cooking Grid Dimensions 32 1/2 X 19 1/2"
Purchased the LG900 grille and I love it. I like the convenience of cooking on it. Easy to use. Very good quality and fit on everything. can you smoke meats such as a turkey in the grill portion of the LG900 ? Hi, Gene. Absolutely! The low temperatures this grill can reach, as well as the smoke from the hardwood pellets, make it a great choice for smoking turkeys and other meats. 32 1/2 X 19 1/2" 22 X 19" 22 X 19" 22 X 19"